During Collaborative Learning (CL), scripted collaboration may cause a motivation problem which makes the students to dislike and drop out the group activities over time. In order to cope with such a problem, we proposed the use of gamification as a technology to increase the students’ motivation and engagement in CL scenarios. As consequence of increasing the motivation of students, we assume a reduction in the desistance of CL activities when the scripted collaboration is gamified. However, gamification is a complex task that requires knowledge about game elements (such as leaderboards and point systems), game design (e.g. how to combine game elements) and their impact on motivation and learning. To address these issues, we have developed an ontology that aims to give structured guidance on how to gamify CL scenarios. In the study presented here, we focused on describing the ontology and how it is used to gamify CL scenarios. We demonstrate the effectiveness of this approach to deal with the motivation problem through an empirical study in which the students enrolled in the introduction to computer Science course at the university of São Paulo participated in either non-gamified CL sessions or ontology-based gamified CL sessions. Significant differences were found in the students’ intrinsic motivation and the percentage of students by groups who had incomplete participation in the CL session. 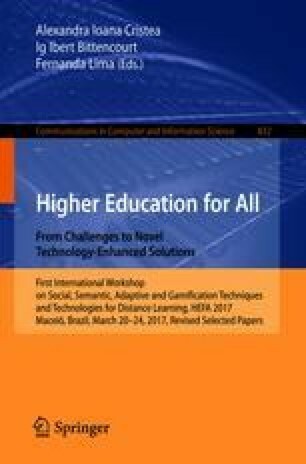 The students who participated in ontology-based gamified sessions reported to be more intrinsic motivated than the students who participated in non-gamified CL sessions, and the percentage of students by groups who had incomplete participation was significantly less in ontology-based gamified sessions than in non-gamified CL sessions. These results indicate that our approach can be used to deal with the motivational problem caused by the scripted collaboration. They also validate the assumption that the gamification of CL scenarios can be used to reduce the desistance of students in CL activities when CSCL scripts are used as a method to orchestrate and structure collaboration. This work was partially funded by CNPq, CAPES and FAPESP.